At the Top of Squirrel Spur: Happy Thanksgiving! I have so much to be thankful for that I couldn't possibly make a list. Hope you and yours are feeling the same on this special day. With the beach vacation and some traveling time, I've finished a couple of projects and have been working along on others. 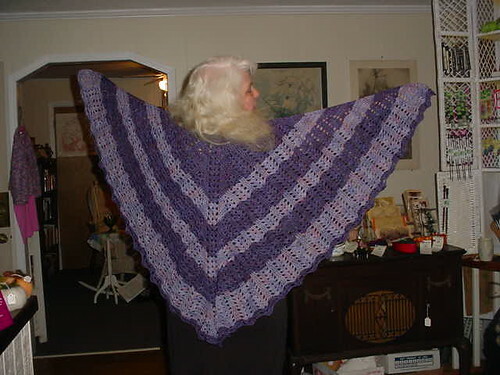 Above is Seraphina's Shawl, made with two colorways of Brooks Farm Four Play yarn. Pure luxury and all purple for me! And I finished my first ever pair of knitted socks, thanks to Jane of Fiber on the Mountain, who is the most patient instructor in the world. She was here on Friday, and was able to teach a new spindler and knitter and help me turn my heel! There are all sorts of faults in this poor little pair, no blame to Jane, but I enjoyed making them! Jane, students and a fascinated little audience! I've finally caught up on most things, and feel myself relaxing into the quiet times of late fall. The autumn leaves are gone, swept away by wild winds over the course of a couple of days and hunting season is in full swing. We're wearing blaze orange, provided by sister-in-law Sue, to walk the dogs in the morning and evening. My Hot Head orange hat is coming in handy to cover up this white hair. Crisp mornings with frost alternate with warmer mornings and fog. There is a forecast of ice for Sunday. A meeting I was supposed to have was cancelled on Tuesday morning, and I didn't find out until I was on the road. So I took the opportunity to play hookey and headed into Blacksburg after picking up my rabbit feed in Price's Fork. 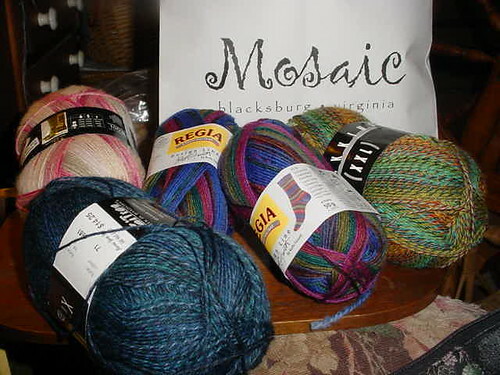 Naturally my first stop was Mosaic, an awesome LYS just a minute, maybe, from 460. I've been there before; everyone was friendly but I just had time to dash in and out with purchases. Tuesday I took my "first socks" along and was delighted to walk in and see Cheryl. She's one of the students pictured above with Jane and took to spindling like a natural! She and Belinda welcomed me with open arms, sat me down to knit with them and even admired my poor effort at sock knitting. 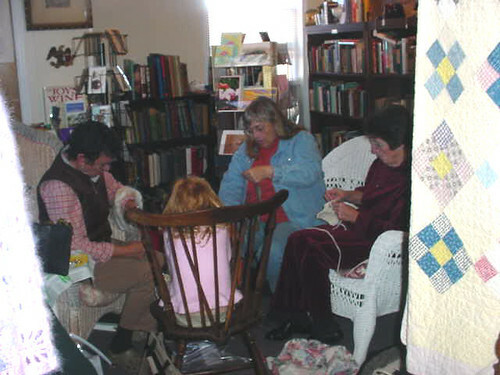 We had a wonderful visit, talking about yarns and books and movies and knitting and the perils of the plumbing in an old farm house! Cheryl showed me around, of course, and I was blown away by all the beautiful yarns and colors. I found myself most drawn to fibers I don't have here by my handspinners, of course, and my mind is buzzing with ideas for wonderful cotton, linen and silk yarns. And I was able to meet the incredible Gina! Just as I was headed out the door with a bag full of amazing sock yarn (yeah, at that point I hadn't even finished one pair yet) Gina came in with lovely little Purl. Purl appears regularly on the Mosaic blog and is just as precious as her pictures. Gina is awesome in person, beautiful, obviously talented (Cheryl showed me some of the shop samples Gina knitted) and charming. I'm enjoying the Mosaic Ravelry group because of all her fun comments and her mention of something on Ravelry made me think to go to Mosaic on Tuesday. And I met the lovely Indigo Muse! 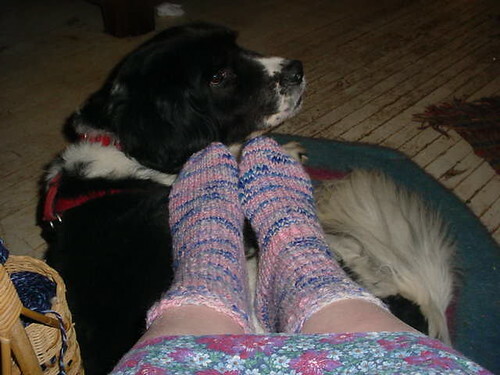 Tanya was my first friend on Ravelry and is a talented knitter, spinner and designer. I knew she was somewhere in Virginia but didn't realize that she was so close to Blacksburg. I've seen some of her designs in different places; her Fortune Cookie pattern looks terrific! 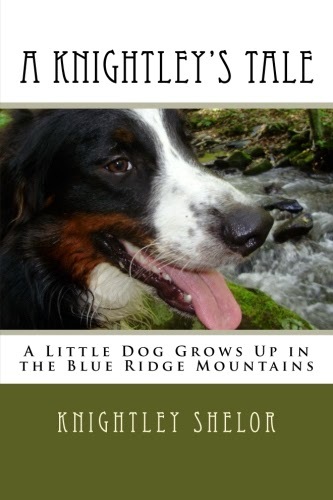 I listened to Lonesome River Band and Sammy Shelor DVDs on the way home. After a visit with Mom and the aunt on the hill, I settled in for an evening of knitting socks and a Doctor Who: Season One DVD from Netflix. For some reason this one disc leap-frogged over the list of Northern Exposure: Season Four that is supposed to come next. I've been a Dr. Who fan for a long time; the episodes used to be on PBS here a long time ago. My TV reception is limited but I've been having a great time getting old BBC shows and old movies on Netflix! Don't forget about the contest! There have been some wonderful suggestions for names for my knitting straw doll but we're still looking for more. My judges will have the list on December 2 and decide soon after that. Details here.